For the second time in three years, a company owned by an NIU alumnus earned the No. 1 spot on the Fast Fifty list by Crain’s Chicago Business, which lists the 50 fastest-growing Chicago companies. This time, it was Brilliant, founded by accountancy graduate Jim Wong (B.A., ’92). With a staff of 59, Brilliant had an annual revenue of $21.6 million in 2014 with a five-year growth of 27,147 percent, according to Crain’s. The vision of the company is to double its revenue by 2018. Brilliant specializes in helping companies hire professionals with expertise in accounting, finance and information technology. It handles screening and interviewing, and gives clients a money-back guarantee if they aren’t happy with the final selection. 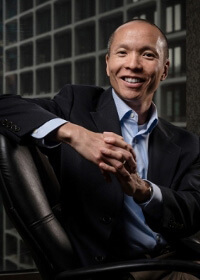 The 47-year-old Wong, who used to run the staffing firm Garelli Wong & Associates, told Crain’s that he has learned to drop clients who view workers – and the staffing firm that supplies them – as a commodity. “We want the companies we work with to place a high value on the people they hire. These are the companies that we will impact the most with our services. Our mission is to make people’s lives better, and we try to do that everyday,” said Wong, Brilliant’s CEO. The company’s name and logo comes from a Chinese character representing a heightened or “brilliant” state of mind, which Wong said is crucial to matching companies with good candidates. Two years ago, Sagent Pharmaceuticals, founded by NIU philanthropist and alumnus Jeffrey Yordon, made the No. 1 spot on the list. Sagent is No. 14 on the list this year.